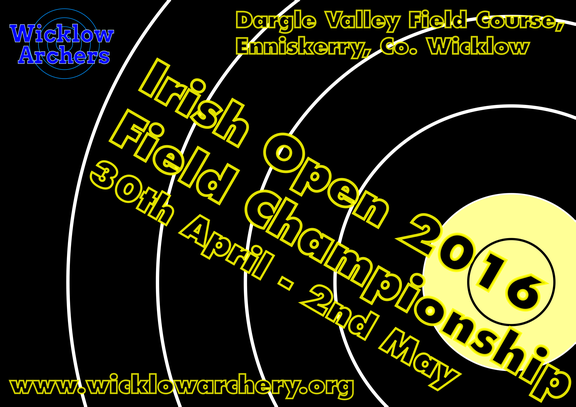 Wicklow Archers are hosting the Irish Open Field Archery Championships 2016 on Saturday 30th April to Monday 2nd May 2016. You have to shoot both days in order to be able to qualify for Mondays elimination rounds in the following categories Recurve / Compound / BareBow – Senior & Junior. Master Archers can qualify to shoot in the Senior category. IT will be a two day event for all Longbow and Instinctive archers and Master/Cadet/Youth categories in Recurve/Compound/BareBow. These categories and bow styles will have their prize giving on the Sunday. Fees 2 day: €30 for senior/master €15 for junior/students/cadet/youth. Format: WRS (unmarked 24 targets, marked 24 targets). Recurve / Compound / BareBow – Senior / Junior are automatically entered for the three day shoot. Recurve / Compound / BareBow – Masters can qualify to shoot in the Senior category on Monday, we will ask all Master archers upon registration on Saturday if they wish to enter for the Senior category.